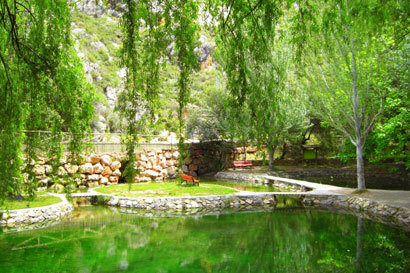 A true oasis, El Nacimiento is a stunning group of large fresh spring water pools that are the source or birth (nacimiento) of the river San Juan. From here the river winds its way to meet the Guadalquivir, and on to the Atlantic Ocean. Set beneath ample trees and within shady, grassy areas, it is both a powerful and peaceful spot that heralds the entrance to this magical valley. Only a short stroll from the Yurt Centre, El Nacimiento can be enjoyed at any time of the year, and offers a very special spot in which to celebrate life and the natural world around us. What reflections will you see in these sacred pools? The russet coloured autumn leaves tumbling zen-like to the water below? The fresh green buds of the new leaves of spring? Or perhaps you’ll experience the buzz of summer as you take the plunge into the pure spring water? And where will you refresh, relax and socialise? 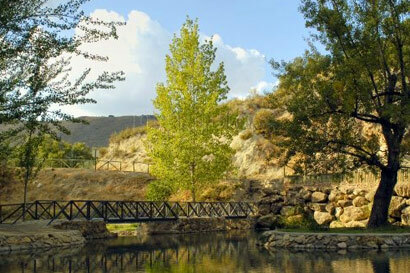 In El Nacimiento’s own bar and restaurant, or with a picnic on the grass under the shady trees? Perhaps you’ll even be lucky enough to witness one of the Gypsy baptisms, complete with white robes, singing, clapping and guitars!